Hello, welcome back. My share today is a card I made for a fund raiser that I am helping France Martin with. Our fund raiser is for Celebrate Pink, which supports people who have breast cancer or are going through treatment for breast cancer. This is near and dear to me since I was a beneficiary of one of their grants a year and a half ago. I also lost my Mother to breast cancer 3 1/2 years ago so I am honored to help with this. My card base is Pistachio Pudding with the next layer being Strawberry Slush. I used the Confetti Celebration dsp which measures 5 x 2 3/4 and then a strip of whisper white finishes off that layer. It is 5 x 1. The greeting is stamped in Basic Gray with the And Many More stamp set. I did use the retired Strawberry Slush ruffled ribbon and then used the 1", 1 1/4" circle punches along with the flower from the itty bitty accents punch pack. Pistachio Pudding is the 1 1/4" circle and the 1" circles are Crushed Curry, Strawberry Slush and Tangelo Twist. 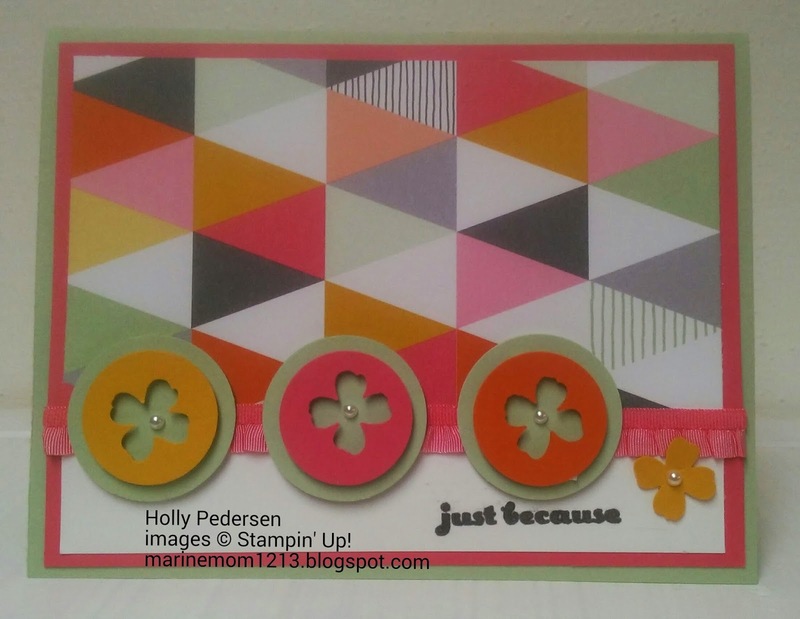 Pearl accents finish off the card. Thanks for stopping by. At last month's team meeting we were given some of the Irresistibly Yours dsp available for free until March 31, 2015 with a qualifying $50 purchase (before tax and handling). I saw a card on Pinterest that I really liked so decided to use it for my inspiration. 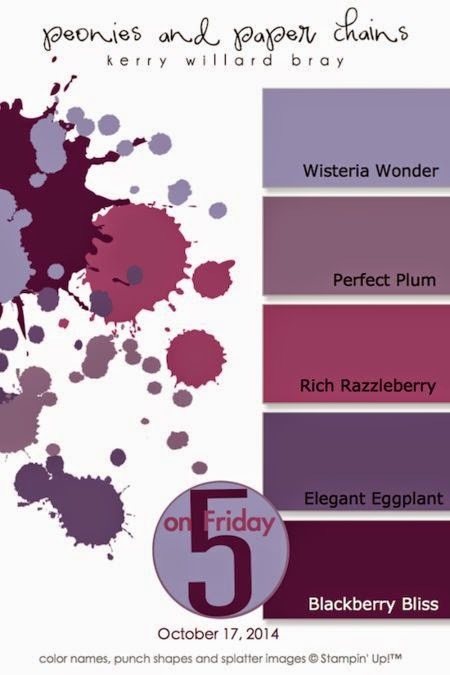 My card base is Blackberry Bliss, then Wisteria Wonder, then Elegant Eggplant, then perfect plum, then rich razzelberry. The final layer is whisper with sponged strips of the Irresistibly Yours dsp. I sponged them in the same colors as my layers. the greeting is stamped in Blackberry Bliss using one of the sentiments from Moon Lake. 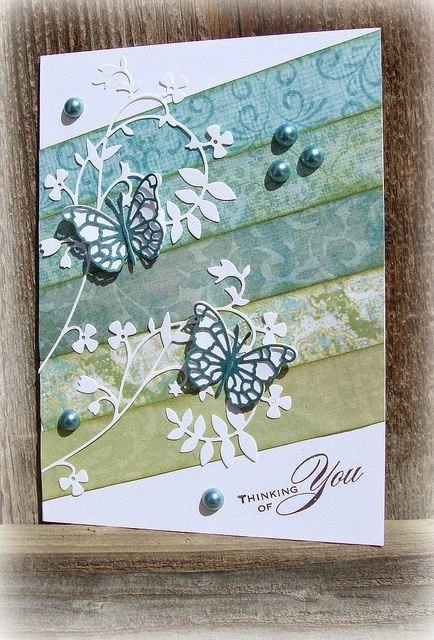 The final touch is a Wisteria Wonder butterfly stamped with versamark using the Butterfly Basics stamp set. I embossed it with a mixture of Dazzling Diamonds and Clear Embossing Powder. 4 rhinestones make up the body of the butterfly.